It has been suggested that List of Roman victory columns be merged into this article. (Discuss) Proposed since May 2014. A victory column—or monumental column or triumphal column—is a monument in the form of a column, erected in memory of a victorious battle, war, or revolution. 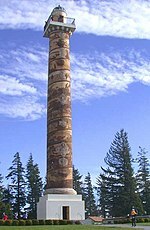 The column typically stands on a base and is crowned with a victory symbol, such as a statue. The statue may represent the goddess Victoria; in Germany, the female embodiment of the nation, Germania; in the United States either female embodiment of the nation Liberty or Columbia; in the United Kingdom, the female embodiment Britannia; an eagle; or a war hero. 115 BC Heliodorus Pillar Vidisha Madhya Pradesh, Central India was erected around 113 BCE in central India in Vidisha near modern Besnagar, by Heliodorus, a Greek ambassador of the Indo-Greek king Antialcidasto the court of the Shunga king Bhagabhadra. c. 400 Iron pillar of Delhi Delhi Qutb Complex 7.12 m It was transferred from Udayagiri or Vidisha to Delhi in the 11th century by Iltutmish the Sultan of Delhi. It was originally erected by the Samrat Ashoka the Great. 543 Column of Justinian Istanbul Square of the Augustaeum Toppled by Ottomans in 1515. 1647 Mariensäule Wernstein am Inn 17 m Transferred from original site in Vienna in 1667. 1679 Beschornerkreuz Vienna Favoritenstraße Badly damaged in World War II and replaced in 1979. 6 March 1829 Demidovsky Pillar Yaroslavl 12 m Dismantled 1935, rebuilt 2004. 1833 La Consulaire Brest Arsenal 7 m Transformed from a captured Barbary cannon. 15 October 1854 & 1855 Prussia Columns Rügen Neukamp and Groß Stresow 15 m Dismantled for repair in 1991 and never rebuilt. 1953 Doyle Monument Guernsey Jerbourg Point Replacing an earlier column demolished by the German occupation. 21 January 2003 Spire of Dublin Dublin O'Connell Street 121.2 m Replaces Nelson's Pillar, which was destroyed in 1966. 2010 The Four Columns Barcelona Near the Magic Fountain of Montjuïc 20 m Replace originals, which were demolished in 1928. ↑ 1.0 1.1 Jones 2000, p. 220. ↑ Adam 1977, pp. 50f, refers to base, column shaft plus capital. This is based on the article Siegessäule in the German-language Wikipedia.